Specialties The heavenly grilled and baked fish, as well as the pizza. Special Gimmicks Before, they used to place a lit candle in an empty glass bottle on every table. It would look beautiful as the candle wax melted around the bottle. If you sit indoors at night, it feels very much like an old tavern. 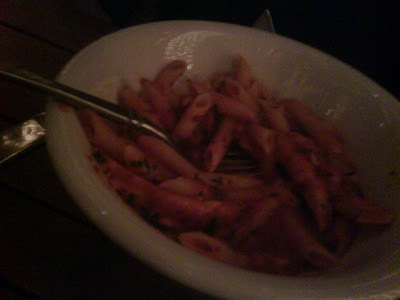 Ambience Bustle, noise, people, the clattering of cutlery on plates, amazing weather outdoors, dim lights indoors, perfect! Favourite table Outside of course! Weather permitting, that is.. Otherwise, inside by a wall. 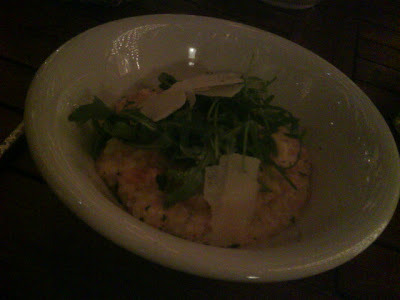 What I ordered Pumpkin and gorgonzola risotto with arugula leaves. bread entree 10/10, warm bread, good variety, and lovely balsamic vinegar. The bruschetta is also heavenly! waiting area horrible! nothing! They're usually so crowded around this time of year that if you want a table outdoors you have to wait around an hour and just walk around the Souk till then. Or you could have some drinks on a couple of their stools outdoors.. if those are available! entertainment Nothing in particular.. people-watching maybe? parking Madinat Souk parking. What I usually do though is that I give the car to valet at Mina Al Salam, just remember to get your slip signed at the Mina Al Salam, you might have to show your restaurant bill. Once again, I apologize for the poor picture quality! It was night and it was a phone camera!